General Federation of Nepalese Trade Unions (GEFONT) Province No. 3 organised Province level youth activist gathering in Kathmandu. The Gathering has formed 15 members Province level youth Committee under the convenership of Cde. Ram Chandra Magar. 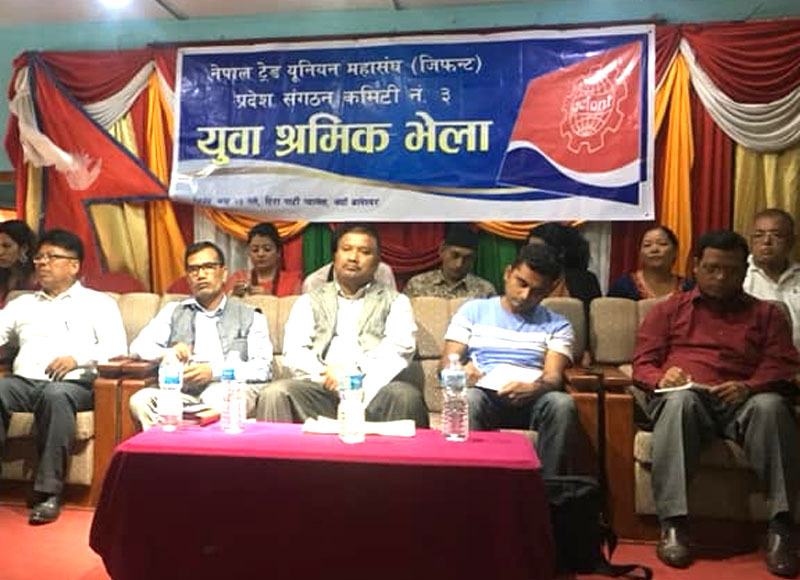 The Gathering was inaugurated by GEFONT President Binod Shrestha during the program Chief Guest President Shrestha suggested youth activist to enhance capacity to lead the movement in future. He said youth have to follow the policy, not the leader. Speaking in the gathering he further added qualified youth leadership can lead movement in the right way. He said” The Trade Union movement has been changed, in the past we had to fight for Democracy, in present workers representation in governance is one of the main issue for us. We trade union has been raising 10% workers representation issue. He urged, youth should initiate and participate in making policies, rules and regulations for the transformation. Youth have to follow and believe in creative competition which will help to enhance their capacity." He further added to Measurement youthhood, only age is not the factor it dependce on your activeness, liveliness too. We believe youth involvement in movement is necessary for trade union future & GEFONT youth Policy is toward that motion. During the program GEFONT Secretary General Cde. Janak Chauudhary briefed about policy, program & about GEFONT solidarity funds. He further added GEFONT youth have responsibility to educate workers about GEFONT Policy and program to Organize young workers in trade union. In the program GEFONT secretary Cde. Beli Maiya Ghale & GEFONT Province No. 3 President Cde. Ram Hari Nepal addressed the program. In the program from 13 districts of the province No. 3 more than 200 youth were participated.